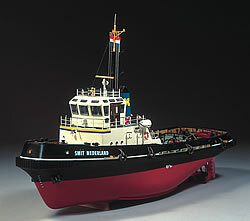 Billings Boats BIL528 Smit Nederland-Ocean Tug 1/33 scale ABS hull! The Smit Nederland was built in 1979 at the BV Scheepswerft & Machinefebriek “De Merwede” in Hardinzveld, Holland. Length 28.40 m, breadth 8,85 m, draught 3.85 m. The vessel is driven by two “Stork Werkspoor” diesel engines, whose 1000 rpm yield 1800 HP. Top speed is 12 knots; the acting radius is 2,250 miles. A special detail of this ship is the propellors, which are equipped with reversible blades in jet streams, and two basin rudders which ensure good manoeuvrability.